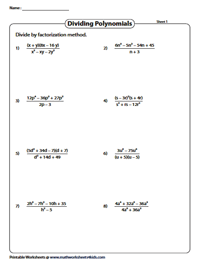 Incorporate this extensive range of dividing polynomials worksheets featuring exercises to divide monomials by monomials, polynomials by monomials and polynomials by polynomials employing methods like factorization, synthetic division, long division and box method. Exercises in the word format are included for high-school students to apply the concept of polynomial division to find the area and volume. 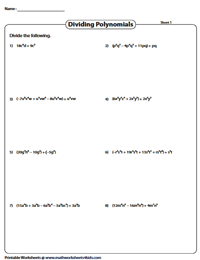 Get ample practice in dividing monomials with this set of worksheets. You may also apply the laws of exponents to solve the problems. 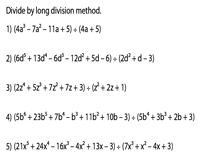 Hone your skills in dividing polynomials by monomials by splitting the polynomial expression term-by-term and dividing each term with the monomial. Use the exponent rule to simplify the individual terms. 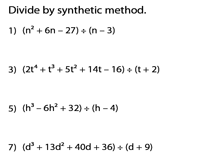 Utilize this alternative method to divide polynomials by factoring them. Factor out the common factors from the numerator and denominator and then cancel them to simplify the polynomials. This method comes handy while dividing polynomials by a linear binomial. 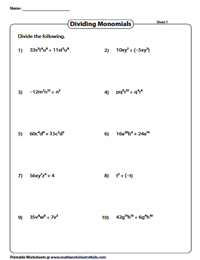 Enhance practice in finding the quotient and remainder with these dividing polynomials worksheets. Set up the division sum by arranging the terms in descending order of the exponents and replace missing terms with zero coefficients, divide until you get a zero or cannot divide further. 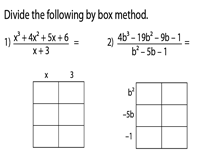 Familiarize high-school students with the box or grid method to divide polynomials. Determine the quotient easily by arranging the divisor in the grid, divide the terms step-by-step and fill in the grids accordingly. 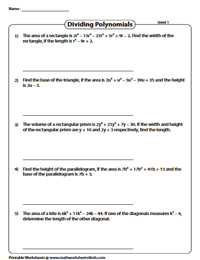 Apply the concept of dividing polynomials in these interesting worksheets featuring exercises in the word format. Find the area, diagonal lengths, missing parameters or volume of the given shapes.